We have little of Laura's correspondence with all that she had in her cottage home destroyed during the vandalization in 1995 just prior to her death. Early preservation efforts however caught the attention of Laura's oldest friend, Marion Herrick, who lived in Wendell, MA. Before her death in 2007, Marion forwarded a box containing all the letters she had saved from Laura, some 35 years of correspondence, to the care of Lichgate. These letters represent a trove of information on Laura's thoughts, her day-to-day life and significant events in both her home and abroad. This page will become the entry for you to explore these letters as we move through them year-by-year and hopefully gain a unique insight into the life of this unique woman. 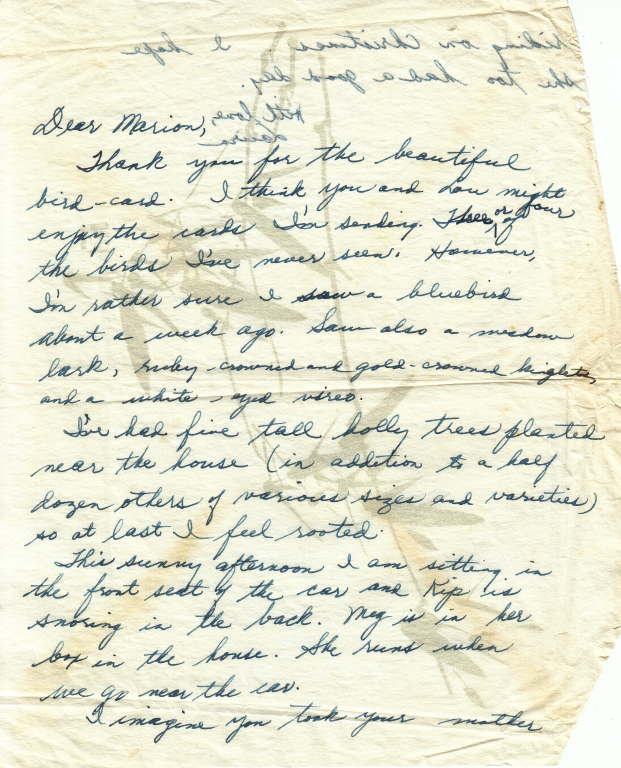 The letters sent by Marion begin in 1960 and end in 1995. To enable future research using the letters I will divide them up by month & year and create a ongoing master transcription of the entirety so that you can search it for any word or sentence you might wish. The master transcription can be downloaded as a Word document or PDF while each individual month/year can be viewed on seperate web pages linked below.